Tune in to WXPR's Northwoods Cafe Wednesday, August 7, at 7 pm for a live broadcast performance with Mike Mangione & The Union. Colleen Finn will be your host with this versatile Chicago/Milwaukee touring group that combines a folk-rock sound with orchestrated strings and soulful vocals. Don't miss this unique Live from the White Pine performance, free and in the convenience of your own home! 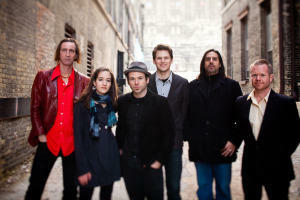 More on the band and their music at Mike Mangione & The Union. The annual WXPR Blues Cruise down the Wisconsin River leaves the dock, Saturday, August 24th, at 1:00pm. We’re thrilled to welcome back Eric “Scrappie” Hughes. “Scrappie” Hughes is a delta blues man direct from Memphis. He’s a fixture every week on Beale Street, playing world-famous clubs like BB King’s and The Rum Boogie Café. Tickets are $25.00. The ticket price includes a picnic lunch on the boat.